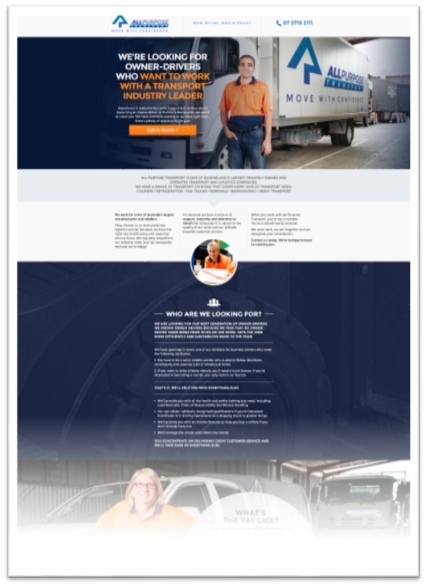 Previously the company had attracted new owner-drivers through placing ads in job-seeking websites and the Courier Mail, but for every $1,000 spent they received just a few enquiries. Corporate Momentum conducted research showing that the number of searches at Google for owner-driver related queries was around 1,200 a month so we proposed an AdWords campaign (the little ads that show beside search results in Google) and accompanying landing page to convert the visitors into job applications. The page and the AdWords campaign are still used to recruit new owner drivers and at last count had resulted in more than 1,100 enquiries. The project has delivered more value than 55 ads placed in job-seeking sites at less than 14% of the cost.